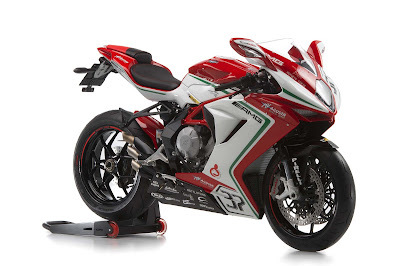 After presenting the new sport motorcycle in collaboration with renowned German tuner, AMG at the Frankfurt Motor Show 2015, and now MV Agusta one of the famous Italian motorcycle manufacturer back to offer another limited edition motorcycle products named 'F3RC World Supersport Replica' that made specifically for the speed lovers. These new MV Agusta F3RC sports bikes built based on a racing motorcycle which used by Jules Cluzel and Lorenzo Zanetti in World Supersport racing event. MV Agusta designed it such that motorcycle racing can still be used legally on the public road. 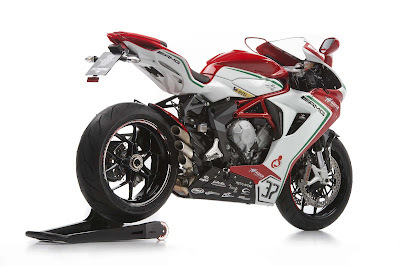 Similarly, as quoted from the MV Agusta's official website on Friday, September 25, 2015. 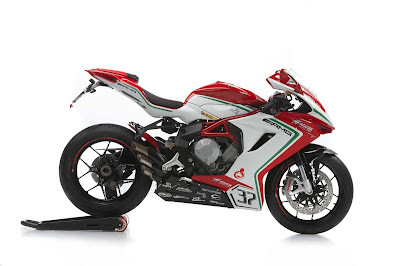 MV Agusta equip the F3RC World Supersport Replica motorcycles with two choices of engine capacity that is 675 cc and 800 cc. The bike that uses a 675 cc engine capable of generating power up to 128 hp at 14,500 rpm and maximum torque of 71 Nm at 10,600 rpm. While the 800 cc engine-powered 148 hp at 13,000 rpm with a torque of 88 Nm at 10,600 rpm. Both models of F3RC World Supersport Replica motorcycles will use design and body stripping similar to the original racing motorcycles. Not only that, Jules Cluzel and Lorenzo Zanetti will directly sign the motorcycle body, and consumers will also get a certificate to prove the motorcycle authenticity.